For those of you who are fans of the hit series Pawn Stars, the names "Old Man, Big Hoss and Chumlee" are old hat. The hit TV series Pawn Stars, which takes place in a real Pawn Shop in Las Vegas and airs on the History Channel, arrived in Vancouver yesterday. 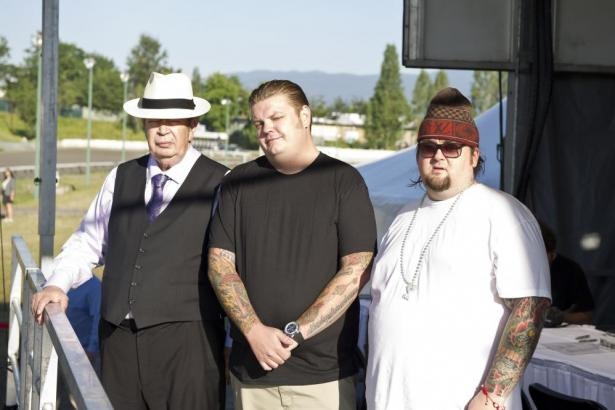 The main stars of the show Richard Harrison "Old Man-the Appraiser", Rick Harrison "The Spotter", Corey Harrison "Big Hoss", and of course Austin "Chumlee" Russell have taken their hit show on the road. Vancouver was the fifth stop on this road tour for the Pawn Stars team, after which they will be heading home for a month until their next event. Unfortunately, the whole Pawn Stars family wasn't able to make the trek up north, as Rick Harrison had recent knee surgery and is presently recuperating on the couch at home. Corey Richardson commented on his Dad's condition saying, "Dad is doing well, relaxing on the couch and taking it easy. The Doctor says he's going to be down and out for 6 weeks". 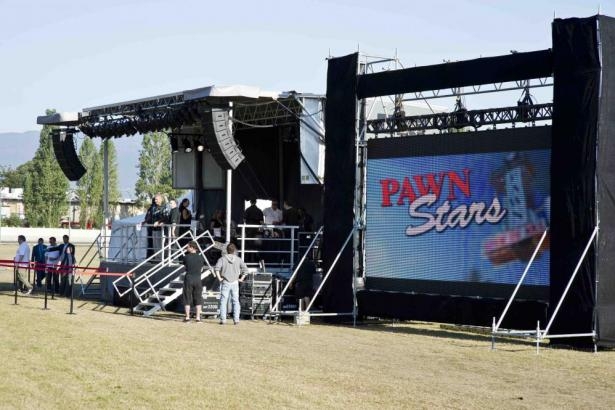 The Pawn Stars set up shop on the infield of Hastings Park Race Course yesterday and invited fans to bring down their treasures in hope of hitting it big, and taking home some serious cash. The line up to see the Pawn Stars started at about 8am for a scheduled 9:30 start and by the time the doors opened their were about 80 to 100 people lined up to barter for their treasures. 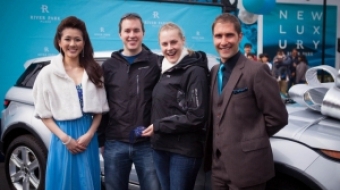 The excitement of the crowd escalated as they lined up in front of the stage awaiting their turn to meet the stars. The event started with the introduction of the "Old Man, Big Hoss and Chumlee" and a short question and answer period with the crowd ensued in which Corey answered most of the crowds inquiries. One question that really caught my attention was posed from a very excited fan who asked Corey: "What was the most expensive thing he had ever bought from someone?" He went on to explain, “One day a guy drove into the lot at the shop, with the title in his hand saying he needed $300,000.00 Dollars for his California Ferrari right away. 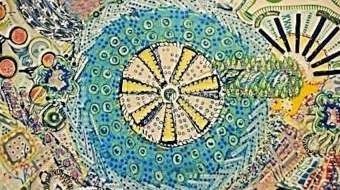 I bought it on the spot and sold it three hours later for $5,000.00 dollars profit". With the introductions and questions answered the pawning could begin. Excited individuals made their way up to the stage in hopes to meet with one of the Stars of the show. A bit of a surprise was awaiting a few of the hopefuls as not everyone got to barter with "the Old Man, Big Hoss or Chumlee". Just like at the store in Las Vegas, not everyone deals with the headliners, as there is a large team that makes up the core of the company business. There are other very experienced individuals that contribute to the Pawn Stars Team that we don't see in front of the camera lens. Some of the team that doesn’t get the attention the headliners do, but are just as integral to the success of the show and the business that travelled to Vancouver were Travis, the "Pawn Manager", Theo "The General Manager", Mark and the staff that do all the behind the scenes business. All of these people are considered experts in their fields when it comes to working at the pawn store. As with items seen on the show, people brought the usual items to pawn; Gold, Rolex watches, antiques, comics, and yes, even Beatles memorabilia. There were of course, the bizarre and unusual items just like you see on the show that individuals were trying to sell. Two of them that stand out for me where the "Ostridge Feet light base" and the "Goats Feet Light Base" -- which I have to inform you didn't sell. I watched as fans came to the stage with great anticipation that the deal of a lifetime was about to happen, only to be brought back down to earth to find out that their treasure wasn't really as valuable or a rare as what they hoped it would be. Now there were some wonderful and historic items that individuals brought to the stage, and a few people did manage to sell their items for a lot of money, but that was the exception. Just like on the show, a lot few people left with everything they had brought, and the looks of disappointment were evident. On the bright side, the opportunity to have their pictures taken and shake the hand of their favourite Pawn Star seemed to take the sting out of making the trip and leaving with no cash. I’m sure those pictures will adorn a photo album, Facebook Page or Flickr page by the time of this articles publication. I did get the opportunity to talk with Corey during the day and found him to be a very genuine, kind and extremely knowledgeable guy and just like on the show, what you get from Corey is totally upfront, honest and right to the point. Now everyone I talked to loves Chumlee, and despite what you see on the show when the camera is on Chumlee, he is a great deal more knowledgeable and personable than the show lets on. 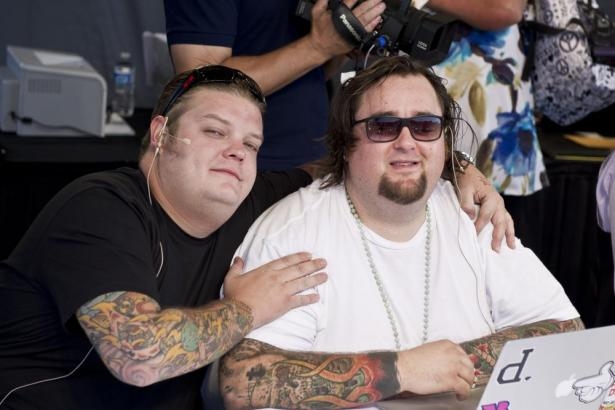 One thing that is totally obvious to most is that Corey and Chumlee are the closest of friends, which is even more evident when you see them working together. All in all the event was a success for the fans of the show who got to meet the Pawn Stars and spend a little time haggling with the best over a price for their treasures. For those of you travelling to Las Vegas in October, the next road event on the schedule for the Pawn Stars is at the ADA (American Dental Association) conference in Las Vegas from OCT 10-13 which Corey's dad Rick is scheduled to be at. You can always drop into World Famous Gold and Silver Pawn Shop in Las Vegas where the Pawn Star call home.